This isn’t just a fundraising letter. Hell, it isn’t just a call to political action. This is my call for a pact of survival. Ignore, for a moment, that BATFE reports the weapons used were purchased legally (as in, with background checks). Never mind that California bans what it claims are “assault weapons.” And forget that, by initial reports, the perpetrators weren’t even on the terrorist watch list. Set aside even the fact that France’s draconian gun bans failed to keep ISIS from getting fully automatic AK-47s. Forget all that because they are secondary to the fact that the President of the United States wants to render you defenseless against exactly the animals who want to kill you. My first request to you is not political, not in the conventional sense. And it is most certainly not a request for money. Instead, I am about to ask you for something far more important, and more dangerous. In part, I suppose I’m asking for civil disobedience. Excoriate me if you will, but here is what I propose to spread across the entire United States: During World War II, Admiral Isoroku Yamamoto said: "You cannot invade the mainland United States. 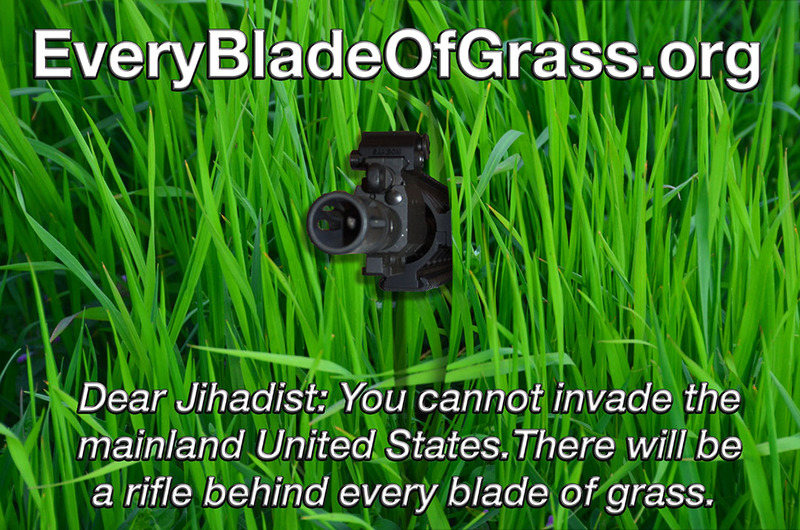 There would be a rifle behind each blade of grass." I am asking you to stand behind those blades of grass. Frankly, few have the guts to say it, but as demonstrated in France and San Bernardino, even a response just minutes away leaves your loved ones dead in seconds. To stop terrorism, your response must be immediate. Train, train, train: Personally, I just took John Farnam’s excellent course, “Armed Response to Terrorism.” Just carrying a gun you haven’t trained with might not provide the benefit we need. Accordingly, in coming weeks we will create a national list of defensive firearm instructors. If you’re like me, whenever Obama or the media start spouting garbage about “gun violence,” I just want to turn off the TV and ignore them. But you can’t. In fact, it is your duty to defeat those who exploit tragedy to steal your freedom. If they fail, Obama is planning to try to run the same schemes by executive order. Go to www.StopTheGunBan.org: Even if you have already signed the petition, make sure everyone you know signs it too. As always, Rights Watch International will be on the front lines in defending your rights against both the Jihadists who want you dead and the leftists who would enable them. P.S. If you have already contributed, I thank you. If not (or even if you have), please consider $50, $25 or even $10 to help GRNC fight for your rights. I vow to put your money to more efficient, effective use in defending your rights than any other organization.